In the tradition of BOOK OF DEATH, ARMOR HUNTERS, and HARBINGER WARS, Valiant's most ambitious crossover event yet starts here! At the dawn of the 41st century, the future of Earth will be decided in the stars. This May…the rebellion begins in 4001 A.D.!<br>One hundred years from today, Father – the benevolent artificial intelligence that governs the island nation of Japan – will gain sentience. To defend its borders, Father will take drastic action by launching Japan into space…where its people will thrive in isolation, away from the overpopulated and resource-deprived planet below. 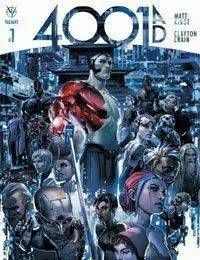 Over the centuries, as New Japan orbits our increasingly unstable world, it will become a model society – one built on peace, prosperity… and Father's control.<br>A thousand years from today, Father will create the first Rai, founding a lineage of technologically enhanced heroes engineered to defend New Japan and sworn to protect it from all enemies. For hundreds of years into the future, the Rai will single-handedly enforce New Japan's justice well…and serve Father without question.